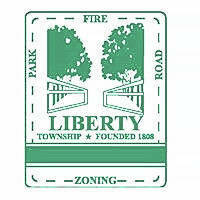 Due to a scheduling conflict, the Liberty Township Board of Trustees met in a special public session Monday in the foyer of the township hall entrance around a small circular table, while residents gathered about. 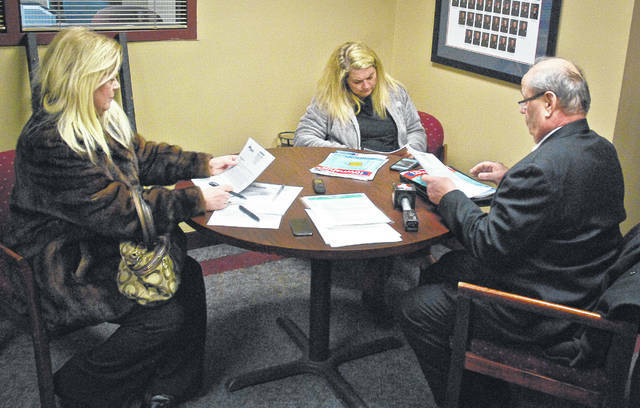 Pictured, left to right, are Trustees Melanie Leneghan, Shyra Eichhorn and Michael Gemperline. The trio discuss a resolution that would have formally rejected Delaware County’s proposal to take control of the township’s emergency medical services (EMS). In a special meeting Monday, the Liberty Township Board of Trustees discussed a resolution to formally reject Delaware County’s proposal to assume control of the township’s emergency medical services (EMS). The measure, however, was stalled when a motion to move it to a vote wasn’t seconded as required by law. The Delaware County Board of Commissioners took action Nov. 26, voting 2-1, to pass a resolution authorizing the county administrator to present a proposal to trustees offering to take control of the township’s EMS. Trustees received the proposal from the county Nov. 28. Eichhorn, the lone trustee who opposes the county’s proposal, asked Gemperline if he had discussed his conclusions with any of the county commissioners. “Did you get that feeling that if we reject it that it would close the door, because that’s not the feeling I got at all when I had that conversation?” Eichhorn asked Gemperline. Gemperline said he had no indication other than there were the three options of accepting, rejecting or modifying. “I’ll go with option three — modify,” he said. Gemperline then commented on a conversation he overheard earlier in the day on Monday involving Eichhorn. Gemperline added he would like it if Eichhorn would work with him and Leneghan on considering possible modifications to the township’s EMS. “We’re not talking drastic things but some tweaking that I think is going to improve the service, and we’ll all be happy,” he said. Eichhorn said she thought the three trustees were working together or at least trying too, but she had a different perspective, which is why the resolution to formally reject the proposal was on the special meeting’s agenda. This entry was tagged D. Anthony Botkin, delaware county, EMS, Liberty Township, Melanie Leneghan, Michael Gemperline, proposal, Shyra Eichhorn, Trustees. Bookmark the permalink.